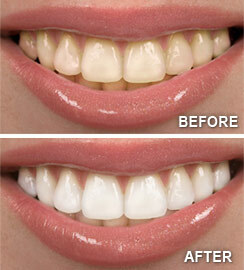 Teeth Whitening- It’s hard to imagine anything more appealing than a sparkling, white smile. Yet our teeth rarely stay as white as we’d like them to without a little help. Fortunately, that help is available at the dental office.Teeth Whitening Before and After. Teeth whitening done in a professional dental setting is a safe, effective way to brighten your smile. It’s also perhaps the most economical cosmetic dental procedure. Depending on the whitening method you choose, results can be dramatic: in-office whitening, for example, can lighten teeth three to eight shades in a single hour. 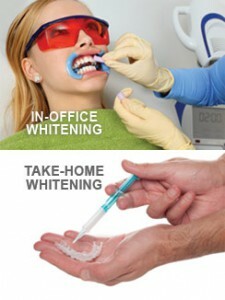 Teeth Whitening Options. In- Office Whitening — This technique offers the fastest results with the most powerful whitening solutions available. First, your gums and tooth-root surfaces will be covered with a protective barrier to ensure your safety. A thin plastic device known as a retractor will hold your lips and cheeks away from your teeth as a professional-strength hydrogen peroxide gel is applied. The gel will be left on for about an hour. When it is removed, the results will be obvious immediately. Take – Home Whitening — This is another effective way to whiten your teeth, though you will play a greater role in ensuring the best possible results and several weeks may be needed to achieve your desired level of whiteness. 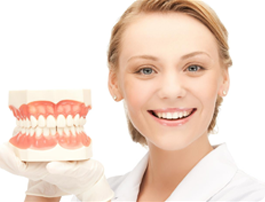 First, a mold of your teeth will be taken and then two thin, flexible plastic mouth trays will be custom-made for you — one for the top teeth and one for the bottom. You will fill the trays with whitening gel and then position the trays over your teeth. The trays are left in usually for about an hour at a time.